After months of rumors, the online retail outlet Nasty Gal has finally opened its first brick and mortar store on Melrose Avenue. We hit the private opening party (a star-studded affair—Sean Penn and Charlize Theron were among the celebs who attended) Thursday night. We checked out the new digs and sat down with Nasty Gal founder Sophia Amoruso before the party kicked into high gear. “It was important to us to open our first store in L.A., in our own backyard,” said the L.A. native as guests started to trickle in to the small space. It’s tinier than you’d expect, given the breadth of merchandise offered on its e-commerce site. Amoruso says she was looking for a cozier space. “We thought we’d put our best foot forward and choose a small space and fill it with our favorite, strongest pieces in every category so that it’s truly representative of the brand.” The store, like the Website, carries Nasty Gal’s own clothing line of runway spinoff styles (there are Tom Ford-esque sequin dresses for $98 and $78 velvet baby dolls that look a lot like the ones from the Saint Laurent fall collection). Jewelry sits in partially opened dresser drawers; don’t be surprised to find $2,000 vintage Chanel necklaces lying next to $25 ones. Nasty Gal is known for its large vintage selection, but instead of creating a separate vintage section, the pieces are commingled throughout the store where $4,000 vintage Louis Vuitton bags sit on shelves above $100 dresses. At the back of the shop you’ll find shoes from brands that are familiar to shoppers of the site—Converse ($80), lots of Jeffrey Campbell ($150)—but not all of them. Still, it’s a nice selection and matches the tightly edited stock of clothing in the front of the store. Right now the place is filled with shiny holiday options. You could walk in and get an outfit—head-to-toe— for your office holiday party or New Years Eve. The standout of the store’s design may be the six dressing rooms, which are located in the middle of the shop in a giant cordoned off, cube-like space, three on each side, facing each other. Between them is an oversized ottoman and plush carpeting. The freestanding dressing room area is made entirely out of two-way mirrors. No one can see in, but while you’re inside you can see out—watch shoppers scanning the racks, your friend waiting for you on the ottoman, a salesperson approaching with alternate sizes. There’s also an awesome infinity effect from the mirrors inside, enabling you to see all angles. What’s with all the mirrors? “I love mirrors,” said Amoruso. “My house is filled with them. It’s a really great, non-techy, way to create a new experience. Plus, it’s another way to create a conversation with our fans on social media.” Expect to see lots of infinity mirror selfies on Instagram soon. 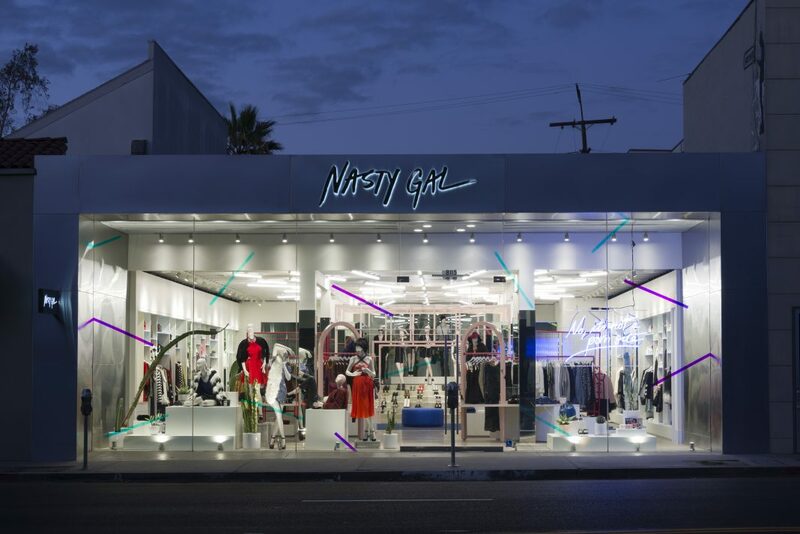 Nasty Gal opens today, 8115 Melrose Ave., West Hollywood.